In the process of creating your project, you may notice that some of your images may need to be adjusted a bit. Maybe it's a dark image, or an image that has too much space around the subject. Whatever the case, there are many tools available to you. 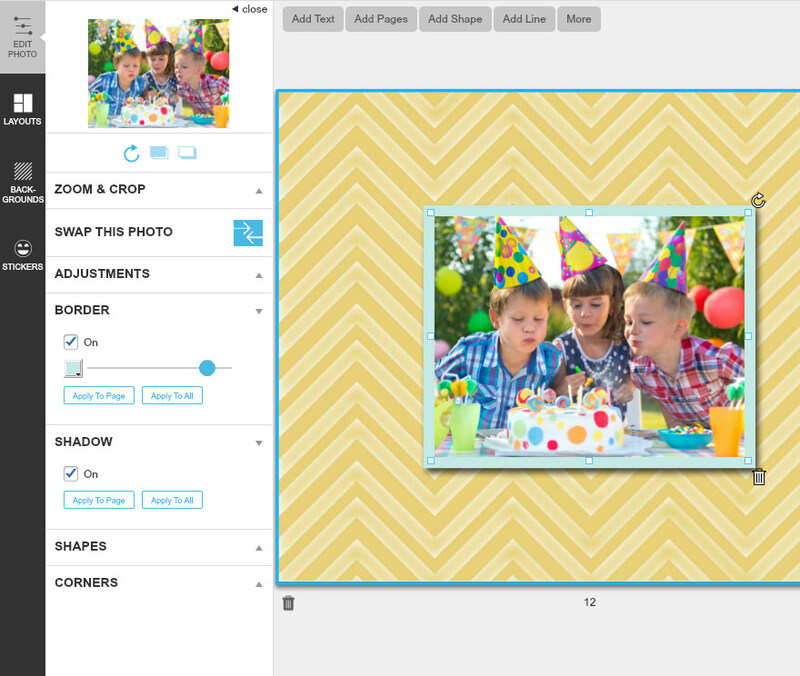 Let's take a look at some of the photo editing tools you can use to make your book perfect. Click on your photo and you will see an editing sidebar appear on the left. Rotate is the semi-circular arrow. If your image has been inserted on the page at a 90 degree angle, you can use this tool to right it. The Rotate tool only rotates clock-wise. So depending on the orientation of your image, it might take a few clicks to turn it upright. Use the rotate icon in the upper corner of the image itself to rotate the frame. Bring Forward and Send Back buttons are next. Those buttons will help you place your items in order on the page where they overlap. You may want text above one of your images, or to bring one image up above another. Each click will send your image forward or back one step. Below this, you'll see the Zoom Slider tool. Slide to the right to enlarge an image within the frame. You can click on and drag the hand icon in the middle of the image to move the position within the frame. Swap this Photo is next. You can use this tool to swap an image on the page with another from that page, or from the Media Tray. Adjustments contains the tools for adjusting Brightness, Contrast, Saturation or the Opacity of your selected image. Sliding these sliders to the right increases the adjustment, to the left to diminishes the effect. You'll also see options for adding a Black&White or Sepia tone to the image. The last icon in that section is the Red Eye Removal Tool. Border is the next tool on the sidebar. You can alter the border size or color around the photo, or uncheck the option to remove the border from the image. Then you can apply any changes you have made to the border to all of the images on the page, or all of the images currently in the book. Shadow provides the option to add a shadow effect to the outline of the image, and apply it to other images as well if you wish. Shapes can add some variety to your page. 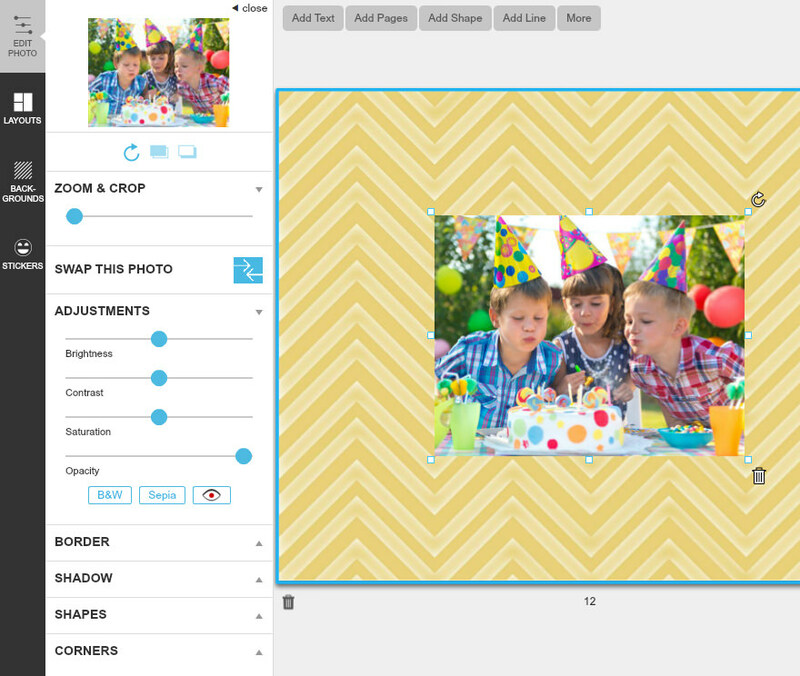 This option will change that shape of the photo frame that the selected image is in. 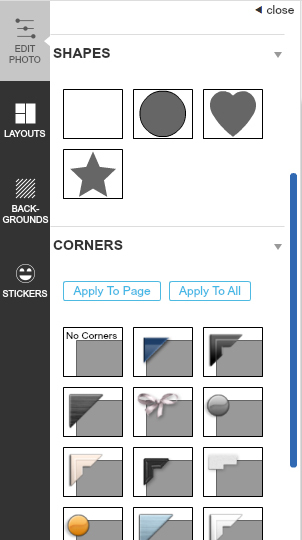 Corners can be applied to your image, and the Apply to Page and Apply to All options are available here as well. If you wish to Delete the image, click on the Trash Can symbol in the lower corner of the image itself on the page. The image will be deleted from the page, but will remain in your project in the Media Tray.